Installing eight-foot-long ground rods can be challenging if purpose-designed driving equipment is not available. Installers stand on ladders, truck beds or use other difficult methods to drive ground rods into the earth. Others cut eight-foot rods into four-foot lengths for installation safety. To alleviate these challenges, ERICO® offers the new ERITECH® Convenient Ground Electrode (CGE) Kit. The kit contains two four-foot, 5/8-in.-diameter, ERITECH copperbonded, steel-pointed and chamfered ground rods; a drive sleeve; an ERITECH compression coupling and an ERITECH® HAMMERLOCK or CP58 grounding connector. The UL®-Listed NEC®-Compliant kit allows for installation from the ground level and is much easier to transport than eight-foot ground rods. Easier to install than 8-ft-long (2.4 m) ground rods; allows installation from ground level. Easier to transport. It can be shipped via small parcel carrier. The ERITECH CGE kits are designed for #6 and #4 solid copper conductor applications with ERITECH HAMMERLOCK and #8 solid to #2 stranded conductors with the CP58 connector. Additional wire size applications may be available upon request. ERITECH copperbonded steel ground rods resist corrosion and provide for a service life of more than 40 years in most soils. 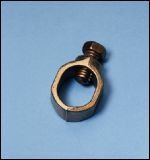 They are manufactured using ERICO’s unique copperbonding process which produces a reliable, long-lasting and extremely durable rod. ERITECH rods exceed the requirements of ANSI®/UL 467-2001, CSA® and ANSI/NEMA® GR-1. The ERITECH HAMMERLOCK taper-fit compression connector included in the kit joins the grounding conductor to the ground rod with the strike of a hammer. No torque wrench is required for proper installation. 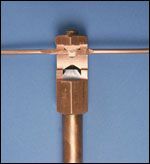 Machined from electrolytic copper, the connection is highly conductive and designed to withstand ground fault currents and lightning transients. The rugged, irreversible UL-Listed connector exceeds the mechanical strength requirements of IEEE® 837 and maintains the highest level of electrical performance for many years after being buried in the harsh underground environment. Kits are also available with a CP58 grounding connector. A coupling and drive sleeve complete the CGE kit. A length of conductor is the only thing needed to finish the installation. UL is a registered trademark of Underwriters Laboratories, Inc. ANSI is a registered trademark of the American National Standards Institute. IEEE is a registered trademark of The Institute of Electrical and Electronics Engineers, Incorporated. CSA is a registered trademark of The Canadian Standards Association Int’l. NEMA is a registered trademark of the National Electrical Manufacturers Association. NEC is a registered trademark of, and the National Electric Code (NEC) standard is a copyright of the National Fire Protection Association.